Want something quick & easy to please the whole family? 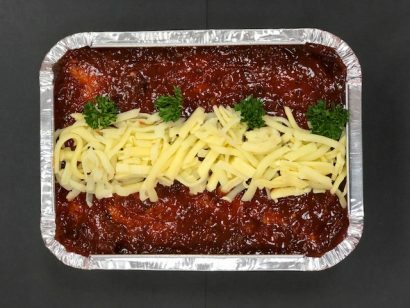 Our Chicken Parmi loaves are packed with hidden veggies. Carrot, onion and tomato are minced together with chicken breast. Furthermore diced bacon, cheese and an Italian tomato sauce are hand mixed through the loaf, all topped with more sauce and mozzarella cheese. Just pop in the oven for 45 minutes at 180° and enjoy! If you love the sound of these but don’t need a whole meatloaf to yourself. Than try one of our Chicken Parmi Parcels. They have the same filling, just a smaller serving and are wrapped in puff pastry.